That passion for raising the hopes, goals and visibility of young artists is why the Anamoose, N.D., native, who graduated from his tiny art-free school in a class of 18, has been singled out as the Fargo-Moorhead Visual Artists Association’s member of the year. The passionate arts advocate will be celebrated this weekend during FMVA’s Studio Crawl Saturday and Sunday. Brad has been inspiring artists to reach higher and go farther in their careers and their communities. After graduating from Minnesota State University Moorhead in 1993, he applied his art education training teaching K-12 art classes in Litchfield, Minn. Five years later, he returned to Fargo-Moorhead at Ben Franklin Junior High School and, in 2003, Fargo North. He came full circle in 2009, when – after completing a master of fine arts degree through the University of North Dakota – he joined the art faculty at MSUM. Today he’s the coordinator of the art education program, accounting for about 65 of the Art Department’s 200 majors, the largest of its kind in the tri-state area. Brad became a regular at the Downtown Street Fair and other familiar venues during his first years back in Fargo. His growing reputation sprang from his distinctive glazed and textured raku pots. He adapted a traditional Japanese technique in which the clay is low-fired in a pit fueled by sawdust or wood instead of in an electric kiln, then glazed when it’s red hot. He has moved on since then to take part in some of the Midwest’s most prestigious juried art shows – this year, including Park City, Utah; Chicago; Jackson Hole, Wyo. ; Madison, Wis.; Des Moines, Ia. ; and Denver’s Cherry Creek, one of the top five in the nation. Things that can be hung – plates and platters – opened up a new market for the enterprising potter. But not until the mid-2000s, as he worked on his MFA degree at UND, did he consider taking on the walls themselves. 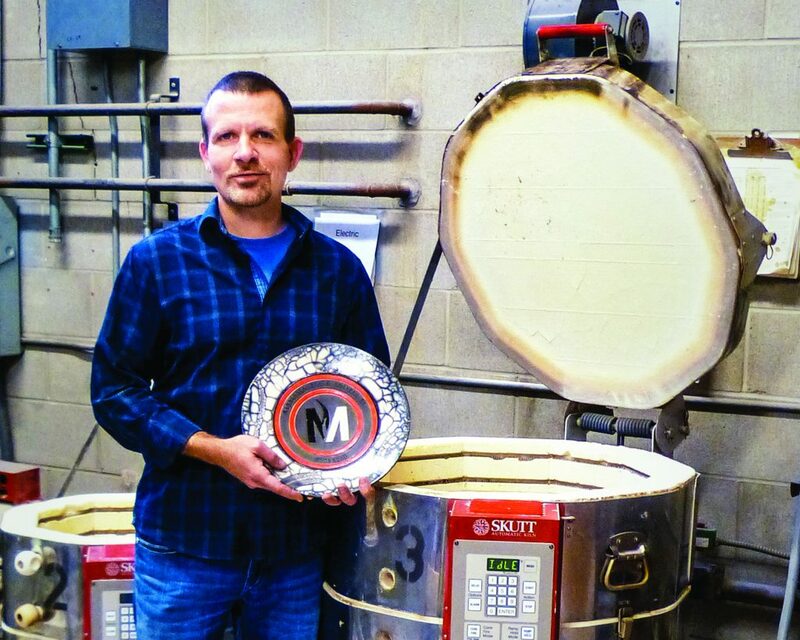 He credits Katie McCleary, a nationally known brick artist then in Grand Forks, with introducing him to the possibilities of truly monumental art – designing, building and firing permanent installations of a size far beyond most potters’ ambitions. He was immediately intrigued by the painstaking process of creating three-dimensional wall murals of carved and sculpted brick – both its creative possibilities and its potential as permanent public art. Today he’s recognized of just 19 professional brick artists in the country. His first project was the wall that still welcomes visitors at the main entrance to Fargo North, where he taught at the time. That led to his first major commission: a 14-by-6-foot mural encompassing the story of the North Dakota National Guard in its headquarters at Camp Grafton. The matrix of some 500 unfired bricks was stacked, then sculpted into 3-D portrayals of figures from military history. After firing, they were hauled to Devils Lake, where brick masons stood ready to install them. Not quite all of them, though. “As they were getting ready, I realized one was missing – one right in the center,” he says. “I panicked! I called my wife, and she found it nicely wrapped in one of our vehicles. I’d taken it to school to show the kids and forgotten to put it back.” Sue saved the day by driving it north … very quickly. Always searching for new opportunities, Brad has taken on new adventures as an artist in residence. He’s spent two-week stints over four years at Lewis and Clark State Park in western North Dakota and three national parks and monuments – Grand Canyon National Parashant Monument, Mesa Verde National Park and the National Petrified Forest. The work he produced there, inspired by natural history and native cultures, is being organized for a national museum tour late next year. The professor shares these experiences, and others, with avid students and fellow artists on campus and in other venues, like the F-M Visual Artists’ gallery talk at the Plains Art Museum last week. He addressed his favorite topic – making a living as an artist. He’s not just happy to answer questions and share encouragement about the endless possibilities waiting to be uncovered. He’s downright evangelical. “Only 3 to 4 percent of students who earn their MFAs in art get college teaching jobs,” he reflects. “So what’s the plan for the rest of them?